The "Take It!" came from the realization that this set of windows offers me a treat or treatment at almost any time I want to look at it. On this particular morning the sun was streaming in, letting me know the forecast for a great day, was coming true. I have a pair of old leaded glass windows that I brought with me from San Francisco propped up behind the shades which give a nice texture to the shadows cast on the lower half of the windows. While the shades do not get any where near darkening the room, they offer just the right amount of privacy by allowing light to come through them. With the inside lights out at night, this same silhouette comes through, courtesy of a street light, that just so happens to be in front of my house. The After Take: The label for this pleasant photo was easily chosen, for it captures this mood setting bit of happiness that is available from any vantage point in the room, both by day and night. I happened upon this treasure by accident, as placed the framed leaded glass window panes in the lower section of the windows thinking they would add some interest to the settings. Little did I know, this placement would offer me many a helping of eye candy has time has passed by. This is sort of one of those "and you too, can do it" photos that I occasionally happen upon and like to pass along. 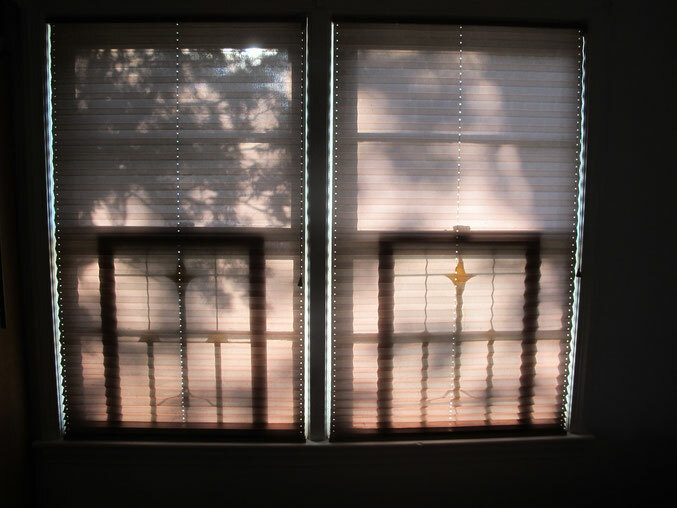 One could easily find or make any type of shape to place in a window and get the same effect. Happiness, is the best form of self medication. PS: Oops, I almost forgot to mention the additional dimension of the shadows cast by the branches from the trees that are in my front yard. They are major players at my home. You notice the most amazing little things! Those are cool looking blinds. The frames from the other windows really add to this. Did you use measuring tape to line this up so neatly? Almost looks like you wouldnt need a light source in that room during the day.